The crashing surf of the Atlantic Ocean is just below the balcony of this 2nd story Carriage House apartment in New Harbor. A pleasant living area offers comfortable furnishings, a tidy kitchen area, and windows to one of the best views available. 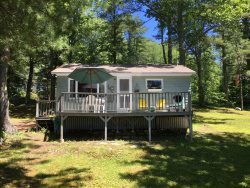 Well equipped, bright, and conveniently located, this property shares the setting with the owner's home, but large pines and a winding drive create a sense of separation and privacy. Available early and late season too! 1 bedroom with twins that can be combined into a king if desired.